I always love my San Diego summer vacations. I always joke about sticking to a strict Mexican Food diet while I'm out there, but if I have a choice of which restaurant to eat at, it's almost always going to be flying the green, white and red flag! It would be way too difficult to choose a favorite dinner dish from this trip, but I did learn to appreciate one of the little things. 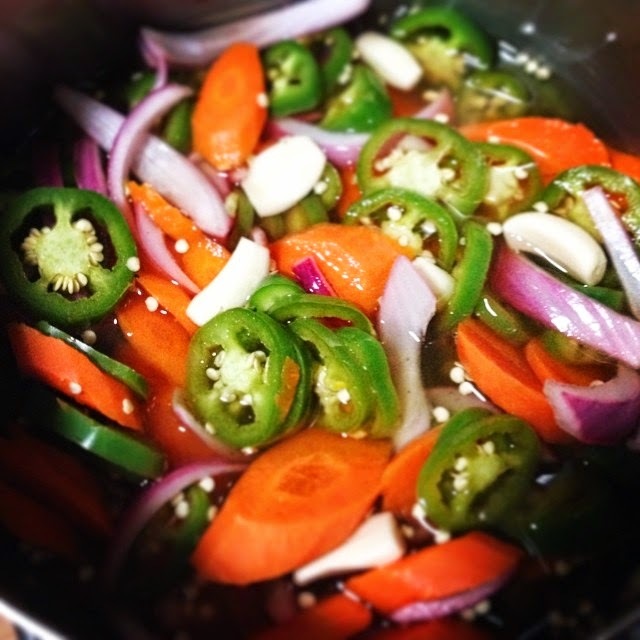 I love those little pickled jalapenos and carrots. They seem to always be served before dinner or as a little dressing on the side. The big, sliced carrots are my absolute favorite, and today, I cleaned them up with some low-glycemic agave nectar and I added a few blistered mini sweet peppers. SO DELICIOUS! Ingredients ready for the simmer! Heat oven to broil. Cut off the tops and stems of the mini sweet peppers and place them on a cookie sheet. Broil in the oven on high heat for about 4 minutes on each side, until they begin to brown and blister. Remove from the heat, allow to cool for a few minutes, slice, and set aside. In a medium saucepan combine the vinegar, agave nectar, salt and pepper. Bring to a simmer, stir to combine and add all the remaining ingredients, including the blistered sweet pepper slices. Stir to combine, cover, and reduce the heat until it just barely simmers. Cook for one hour, stirring occasionally. Remove from the heat and allow to cool. Store in airtight containers and keep refrigerated until ready to serve.